It is the wee hours of the morning (5:00am) as I sit down to type this, having not been to bed yet. I've been cleaning the house for the past couple days preparing for last minute guests this weekend who are coming to visit their mother who lives with us (my mother-in-law). Normally this wouldn't be an issue, but the house is in such disarray from the kitchen facelift that is taking place. The amount of dust from all the sanding prior to painting is ridiculous. I am exhausted and my eyes are burning, so be warned the content contain herein may be the ramblings of a burned out man who smells strongly of Windex and furniture polish. Amidst the chaos of the renovations, I was able to get a few game sessions in this week. I'm still undecided about Killzone 3. It is extremely generic feeling, offers very little in the way of exploration, and boils down to a very pretty shooting gallery. The story is actually not bad and gives a great presentation of both sides of the conflict. The voicework is generally well done and James Remar is always great to listen to but the terrible overacting by Malcolm McDowell is cringeworthy, even for him. I think I would score the game up to this point with a big "meh" if not for the Sharpshooter. It is really a great experience with the Sharpshooter and I actually wonder if a lot of the development decisions (less exploration, more shooting gallery) were in favour of selling people on the Sharpshooter. I always thought the Wii offered a great way to control first person shooters with their Wiimote+Nunchuk, but the Move really feels much more accurate (or is it smoother motion?). Coupled with the Sharpshooter with the pump-action reload, I think it might be one of my favourite motion controller applications to date. That said, I haven't actually use the Move + Navigation Controller on their own, so maybe they offer a different/better experience than the Sharpshooter. However, there is something so exciting about aiming down a weapon in your hands and having those controls translate so well to the action on the screen. I'm really late to the Move/Sharpshooter party, but well done Sony! It is a shame it didn't sell better. I'm very excited to see how it fares in Resistance 3 (though I guess I should play Resistance 2 first). I also had a chance to play The Elder Scrolls Online with my gaming buddy last Wednesday. I am starting to see how I am not on a schedule to be paying $15 a month for a game when I only can play it once a week, but oh well...in for a penny, in for a pound. I'm actually starting to really groove on the game and I think the biggest reason is the economy. I am broke as a player at level 15. I have 4000 gold on my way to saving for a backpack upgrade that will run me 5900 gold and it has taken a fair bit of time just to save up the 4000. You make 1 gold off of most encounters and while you earn a little better gold from selling drops, there isn't a lot of drops and those drops are often best used for learning crafting skills or gaining crafting elements. I LOVE the fewer drops. I hate having to spend a lot of time in my inventory comparing items and looking at all the new stuff I pick up every few seconds that I seem to do far too often in games nowadays. Good loot is hard to come by in ESO and even regular loot isn't all that frequent compared to the number of encounters. So as you can see, money is a bit of an issue. I wonder if a lot of this might be because the devs have broken the economy in hopes that you will purchase a horse via microtransaction for $15 more of your real hard-earned money (which I won't do). A basic horse will run me 17,000 gold to buy in-game. That isn't even conceivable at this point for my character. Whatever the reasons for the sparse loot (maybe this is a staple of MMOs to keep the player playing longer), I love it. I have to finally invest time learning how to craft items and collect resources for crafting which is something I never bothered with in other Elder Scrolls games. In the other TES games I always seemed to be flush with cash and never needed to bother with the creation aspects in the game as a matter of survival since I could just buy what I needed. The best thing about earning little money (and something that should be added to future Elder Scrolls games) is that it costs a fair bit of money to fast travel. I've never been a fan of fast travel since I think it ruins a lot of the exploration and inventory decisions you should be making as an adventurer. Some of the best RPGs I've ever played involved survival aspects; such as having to worry about what you take with you on the field and what you pick up to bring back. While ESO doesn't go that far, it does really restrict the ability to just flit about on the map and return at will to a town. To travel for free you have to make it to a Wayshrine (which admittedly isn't that tough at this point) but I do have my travel restricted to the Wayshrine points. You can fast travel from anywhere to a Wayshrine, but at a fairly serious cost (at least at my level) and there are limits as to the frequency you can do this. This enforces a good sense of exploration to the game and makes fast travel certainly nothing to take lightly for the lower level character. I was never comfortable with just being able to teleport to known places "at will" in the later TES games. The idea of a great land to traverse and the daunting idea of distance are completely ruined by fast travel. I personally think traveling in a TES game should make you care more about your inventory and optimizing your route. I found the approach to travel in a game like Morrowind far more rewarding than having Scotty beam me anywhere I want in Oblivion. While The Elder Scrolls Online doesn't return to the Morrowind-style of travel, it is at least a great step in the right direction and actually gives me a reason to want a horse. So...so far, so good for ESO for the guy who doesn't like MMOs. A quick Happy Mother's Day to all the mother's out there, to my wife, and my own mom. My son is going to take his mom to Tim Horton's (donuts and coffee shop) on Sunday with his own money to buy her "anything she wants". But don't tell...that's still a secret! 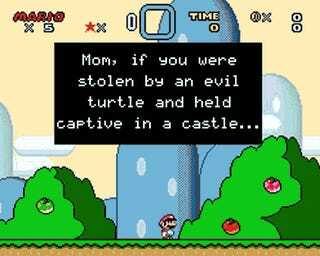 So, what are you playing this Mother's Day weekend?